We recently got tasked by LG Australia to create an online campaign for their top range of Smart TVs. The general point of Smart or Connected TVs is to combine web browsing and accessing personal and social media with scheduled free-to-air and cable TV programs. We created a not-so serious dramatisation of the users’ entertainment options. 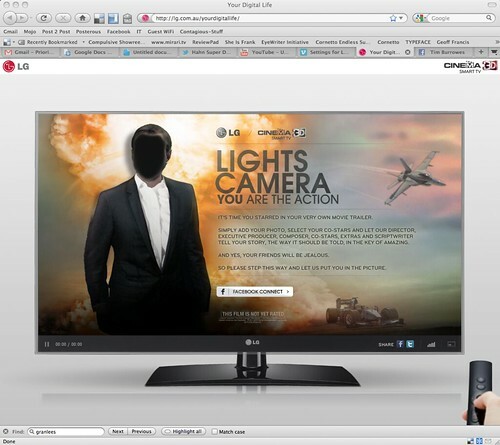 Our “Your Digital Life” makes you the hero of an impossibly awesome movie trailer. From action, sports to romance, you can have it all. Oh, and did we mention a Nobel Prize worthy intellect holding it all together? The talent in this example is Tim Burrowes, editor of Australian marketing blog Mumbrella. The Facebook integration contains potentially a world first. As soon as you connect via facebook “Your Digital Life” features your face, personal facts and friends prominently in the film. But additionally it uses text-to-speech to turn 2 of your status updates into dialogue in it. So true to the tag line, an LG Cinema 3D Smart TV really “puts you in the picture”. Just today I stumbled across a classic Italian animation, “La Ligna” with a story line not unlike our “Your Digital Life”. Being framed in the television set did not seem so desirable back in the 1970s. Additionally, BBH Labs wrote an interesting piece on the impact of connected TV on video content production and advertising. Check it out here: Part 1 and Part 2. Indeed, how much will these TV sets change the way we couch surf? What do you think?